This photo was taken on May 10, 2013 in Naththandiya , North Western LK, using a Canon IXUS 210. Sri Lanka Transport board (SLTB) Wennappuwa depot, AEC Routemaster double-decker bus (WP 14 / 60ශ්‍රී6639) at Naththandiya. 50 of ex London Transport, AEC Routemaster double decker buses donated by the United Kingdom in 1989. -- ශ්‍රී ලංකා ගමනාගමන මණ්ඩලයේ (ශ්‍රී ලං.ග.ම.) වෙන්නප්පුව ඩිපෝවට අයත්, AEC රූට්මාස්ටර් වර්ගයේ දෙමහල් බස් රථයක් නාත්තන්න්ඩියේ දී. සම්පූර්ණයේම එංගලන්තයේ නිෂ්පාදිත මෙම බස් රථ මුල් කාලීනව ලන්ඩන් ට්‍රාන්ස්පෝර්ට් යටතේ (x London Transport) සේවය සපයා පසුව ආධාර වශයෙන් 1989 වසරේ ශ්‍රීලංගම හා එක්වී ඇත. පසුකාලීනව උඩහමුල්ල ඩිපොවෙදී අලුත්වැඩියා කර නැවත ධාවනයට එකතු කර ඇත. 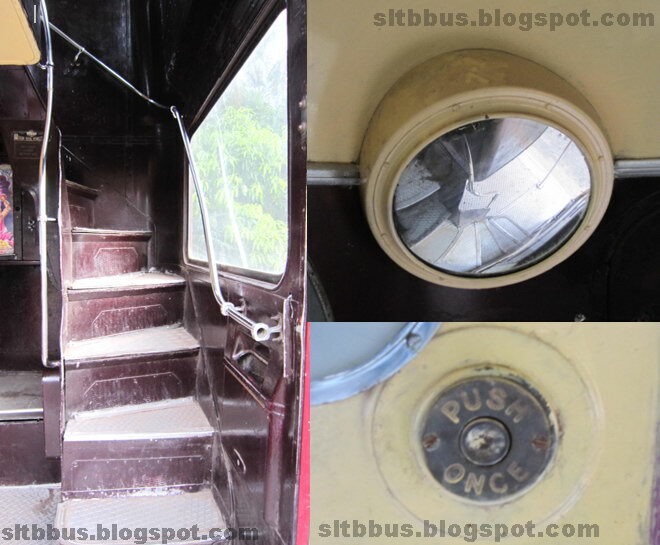 Interior of the Bus (lower deck) -- බස් රථයේ ඇතුලත (පහල තට්ටුව). ඉහල තට්ටුවට ඇති තරප්පුව හා ඉහල මාලයේ සිට තරප්පුව දිස්වන කන්නාඩිය. ඊට අමතරව සීනු බොත්තම ද රූපයේ දැක්වේ. This photos was taken on May 10, 2013 in Naththandiya , North Western LK, using a Canon IXUS 210.
classic routemaster ha routemaster bus athara wenasa ?